It's easy for employees to fall into patterns of "stuck" thinking. They come into work, do their job, go home, and collect a paycheck at the end of the week. An employee can be a hard worker and dedicated to the job, but still be stuck - following procedures, just doing things the way they have always been done. Stuck thinking isn't limited to employees, either. Supervisors and managers can also suffer from stuck thinking. In fact, entire teams can be stuck in their thinking. They are working hard, but they could be working smarter. The high cost of stuck thinking is measured in terms of opportunity cost. Hard-working teams regularly come across opportunities to be more creative to improve workflow and increase productivity; but if they don't see these opportunities, because they are stuck in old patterns, change doesn't happen. Opportunity cost is hard to measure, but there is no doubt that it impacts your bottom line. Human beings, by nature, are creatures of habit. We find ways of doing things and repeat those same behaviors. The job gets done - but we may be getting stuck in a rut. Einstein's definition of insanity was "repeating the same behavior, expecting a different result." So by that definition, you could characterize the behavior of many employees, managers and teams as insane. But it's understandable: this kind of insanity is human nature. What's worse is repeating the same behavior for so long you become content with the same bad results. That's not insanity - it's mediocrity. In either case, the cause is stuck thinking. How do people and teams get stuck? It's human nature. How do they stay stuck? It's human nature. Although it is human nature to gravitate toward habitual behaviors, we all have the capacity to be creative. We have to learn when to use our habits and when to use our creativity. Isn't it great that we don't need creative energy to keep breathing? Our habitual nature takes care of every breath and we don't need to think about it. Some people know their job so well, they can do it in their sleep (and some of them do). Other people see their work as an expression of their creativity. 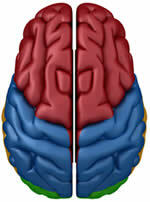 They have awakened their capacity for creative thinking and they use it at work every day. The result is increased passion for their career, greater job satisfaction, higher energy and increased productivity. It becomes very clear that if we can awaken more creativity in people and teams, amazing results will follow. We offer training and coaching as tools for awakening the creativity of your people and teams. Training gets the process started, and coaching keeps it going. If your managers and supervisors can be the coaches, the result will be an awakened, creative workforce. But who will coach your management team? Roger Reece is an executive coach who can develop the creativity and coaching skills of your managers and supervisors so they can more effectively coach their teams. If your managers are to improve their creativity and coaching skills, they need the help of a good coach to get there. Too many managers who should be leading their teams toward higher levels of creativity and productivity are doing just the opposite because of their stuck behavior. Please visit our Workplace Behavior Coaching website at www.WorkplaceBehaviorCoaching.com for more information about our coaching programs. When you schedule your creative thinking workshop, you will have the opportunity to work with Roger Reece in planning your program. Ask him about coaching for your managers. Pick one manager to use as a test case and then observe the behavioral changes that result from the coaching. If you're like many of our clients, you will quickly see the benefits of getting your entire management team into an executive coaching program. Contact us for a free telephone consultation with Roger Reece. 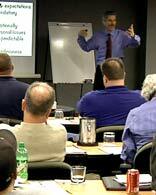 Roger will work with you to develop a workshop that fits the needs of your team. After the call, Roger will send you a detailed outline, agenda and proposal for a program that meets your objectives and your budget. Our creative thinking training workshops are more than just training - each workshop is a creative thinking experience. 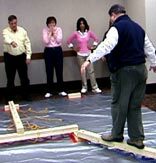 We include experiential learning exercises, activities and business simulations that engage your team members in solving problems and accomplishing team goals through creative thinking. The activities are fun and highly engaging, and in every case the best solution is always found by thinking outside the box. The phrase "out-of-the-box thinking" may be a cliché, but our creative thinking activities are no cliché ice-breakers. They create powerful "aha" moments that show participants experientially that the way you think about a problem largely determines the success of your efforts. The activities we include in our programs are carefully selected and geared specifically to your team's needs. Activities are followed by debriefs in which Roger Reece helps the participants uncover connections between the exercise and the larger training module. The debriefs are highly interactive, and participants are guided by Roger into sharing their experiences of how the activities have affected their mental models about the practical application of creative thinking. Some training seminars may be tedious and boring, but no one ever feels that way about our creative thinking training workshops. Our programs are fun and entertaining, and every participant gets involved in the learning process. People are more creative when they step back from the everyday tedium of their routines and allow themselves to have fun. If you are interested in adding an extra measure of fun and entertainment to the workshop, we can include Roger Reece's alter-ego Buford P. Fuddwhacker to the mix. Buford is an outrageous country philosopher, inventor and technology guru who will get everyone involved in a creative-humor group experience. 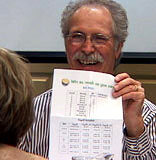 In a workshop where Buford is included, Roger often morphs in and out of his Buford Fuddwhacker character multiple times to bring creative entertainment to the session at just the right times. Some people are "left brain" thinkers - task oriented, process-oriented, logical, analytical and linear - while others are more "right brain" - intuitive, feeling-oriented, aesthetic, subjective and holistic. It is often said that right-brain people are the more creative type, but we believe creative thinking has more to do with using the parts of your brain that are under-utilized. So, while creative thinking for left-brain people may be all about kick-starting right-brain processes, for right-brain people, creative thinking means switching on the left side of their brains. Regardless of what is happening physiologically when your creative mind is at work, it is obvious that brain centers are activating to expand your thinking. Neuroscientists tell us that we are usually limited by neural pathways in our brains: patterns of automatic thought that cut ever-deeper grooves as we use them more and more. Creative thinking means jumping those tracks and forging new paths; it means learning to break out of old patterns of thinking. Our workshops create an experiential learning environment where participants think in new ways and learn how to cultivate creative thinking at work and in their daily lives. Everyone is different, and we all have our own behavioral patterns. Understanding your patterns is often the first step to creatively stepping out of them. Many of our creative thinking training workshops include DISC assessments, giving participants a valuable perspective on their behavioral patterns. The DISC Behavioral Style Model is widely used in business skills training to help managers and employees understand their own behavioral patterns and the patterns of the people they work with. Personality clashes often occur when people of different behavioral styles work together. Synergy occurs when those diverse styles are combined in a way that results in greater creativity. We use DISC assessments to help individuals and teams work around style conflict and create synergistic team relationships. About a week before the workshop, each participant completes an online survey and receives a 20-page DISC assessment outlining her/his behavioral style. During the workshop, we use the assessments as a tool for understanding how the behavioral styles of team members affect creative thinking and team process. The assessments personalize the workshop for every participant, and we highly recommend including them with the training program. 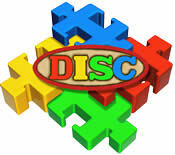 For more information, please visit our DISC Training Workshops website at www.DISCtrainingWorkshops.com. In our creative thinking training workshops, we always focus on the importance of creative thinking in problem-solving. To increase the practical value of the workshop, Roger Reece frequently facilitates problem-solving sessions where small groups can outline solutions to problems the participants currently face. The groups share solutions and Roger leads a process of formulating effective procedures. Rather than working only with general case studies and hypothetical scenarios, the creative thinking tools and techniques from the workshop come into play in solving real problems and making impactful decisions in team-members' own lives. In shorter workshops, this may be a ninety-minute module, while in other cases, the problem-solving sessions could be a half-day or more of the training schedule. Roger Reece will work with you during the planning phase of the workshop to assess your priorities and determine the ideal mix of training, experiential learning activities and facilitated problem-solving sessions for your team. Often, the problem-solving and decision-making sessions we conduct are focused on setting future directions. A creative thinking workshop can be the perfect format for your next strategic-planning meeting or retreat. If you have had past experiences of planning meetings that were stale and seemed to go nowhere, you may need an infusion of creative thinking to get people in the right frame of mind for strategic thinking. Team goals are always more effective when they are created through a group process with concrete buy-in from every member of the team. Roger is an expert at facilitating the process of keeping everyone engaged in thinking creatively about the future. After your creative thinking training workshop, you can expect to begin seeing results right away, in the day-to-day interactions of your team members. To keep the focus on creativity, Roger Reece often facilitates a "Creative Ideas for Fostering Creativity" session during the workshop. In this session, small groups are given the task of coming up with creative ideas for fostering more creativity within the team. Each idea is formed into a project plan for implementing the idea. Ideas might include social and team building events, contests, new programs, processes and activities, or anything else that will keep fostering creativity within the team. 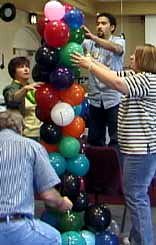 Some groups have created quarterly or annual events that become team or company traditions focusing on the creative process. 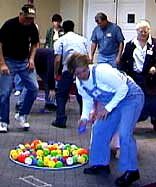 Others initiate fun, colorful and practical everyday programs for getting things done in new and creative ways. 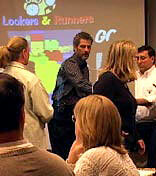 Often, these programs include recognition for the creative ideas and efforts of team members. In every case, the ideas generated in these sessions serve to extend the effects of a one-day training workshop far beyond the workshop itself. How many people do you need for a creative thinking training workshop? How many do you have? We have conducted these workshops with as few as three people (we call these small-group sessions coaching workshops), and as many as 1,500. 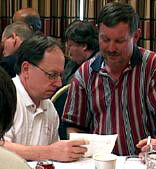 Our typical workshop is within the range of 10 to 100 participants. With large organizations, we generally recommend doing multiple sessions for different groups over a period of days, so that every employee can benefit from training. How long is a creative thinking workshop? It really just depends on how much time you can invest in the process. We can conduct a one-hour creative thinking presentation as a keynote, or as a concurrent session for your next conference. 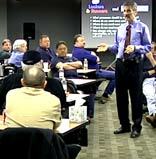 We can give a 2-hour mini-workshop for your team. If you would like to really make an impact, we can organize a series of full-day workshops over a period of months or a year. The most common arrangement for one of our creative thinking workshops is one full day; this provides ample time for exercises, activities and facilitated problem-solving. Where do you conduct the workshops? That's up to you. If you have a training or meeting room that is the right size for your group, we can do the workshop in-house. Of course, many of our clients prefer to be away from interruptions while training, so they reserve a meeting room at a hotel, conference center, or other offsite facility. Often, our clients combine their creative thinking workshops with planned events, such as annual or quarterly meetings, conferences, retreats or strategic planning events. We can structure the workshop as a single program or as a series of modules interspersed with your event sessions. This makes a multiple-day event come alive, keeping everyone thinking about creativity throughout the week. 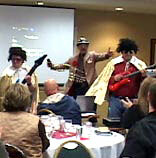 You can even book Roger Reece's alter-ego, Buford P. Fuddwhacker, as your after-dinner entertainer. Please visit our Fun Motivational Keynote Speaker website at www.FunMotivationalKeynoteSpeaker.com for more information about Buford Fuddwhacker. We will fit the workshop to your needs. Contact us to schedule a free telephone consultation with Roger Reece, followed by a detailed proposal for a creative thinking program to meet your objectives.